Turkey-Avo-Cheese Sandwich - A recipe from Savor California, the online showcase for extraordinary gourmet foods and beverages from California. The turkey can be left out for a tasty vegetarian sandwich. Spread desired amount of Mendocino Mustard Hot & Sweet on both halves of toasted English muffin or roll. 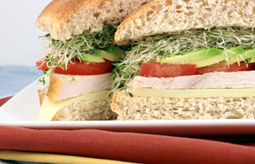 Add cheese, turkey, tomato, avocado and sprouts. Sprinkle with sesame seeds, if desired.